The cadence of a runner, is the number of steps that the runner takes per minute. For people interesting in practicing running technique and form, cadence is often one of the focus points. If your cadence is too low you may be overstriding which can cause all sorts of injuries. Whether or not there is an optimal cadence, and how this might vary with pace, appears to be the subject of some debate. In any case, it is often hard to gauge what your pace is when running without a foot-pod that measures this explicitly. You can of course try to count your steps while running and keeping track of the time, but this is cumbersome to do during a run, especially when you are getting tired. 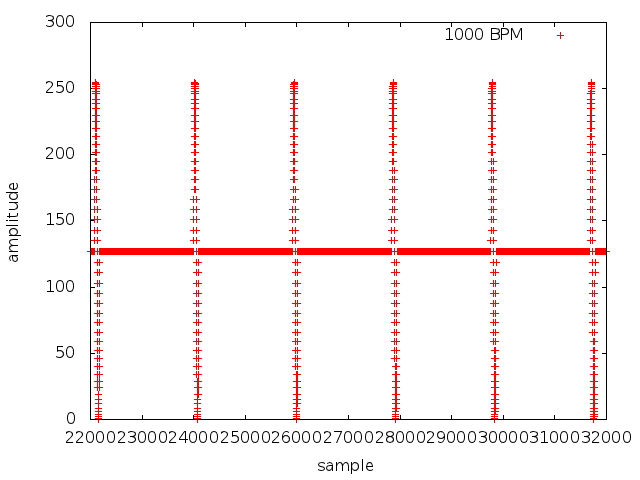 It is popular to use music where the beats per minute (BPM) of the music approximately matches your desired cadence, and there are multiple services that help you find good music corresponding to a given number of beats per minute. Each file is 2 minutes long. If you want a different number of beats per minute, check out if it is already available in the full list. If not you can download and compile my metronome software to generate your own files. This also goes if you want a different duration.